The Navy Department assigned the minesweeper Whippoorwill, under Captain W. J. Poland, to survey the Line Islands; the first group left Honolulu on July 24, 1924. The scientific personnel were under the leadership of Charles H. Edmondson, and the members of the group concentrated on zoology, botany, conchology, entomology, and geology. The second group, with C Montague Cooke, Jr., in charge of the scientific personnel, left Honolulu on September 15, 1924 and visited Baker and Howland Islands. A good deal of material in the natural sciences and geology was collected, and the ensuing reports were published by Bishop Museum. Notes on and a location map of some archaeological remains on Howland were made for future study. Part of the equatorial “Line Islands” and “Pacific Remote Islands,” Baker, Howland and Jarvis Islands were first formed as fringing reefs around islands formed by volcanoes (approximately 120-75 million years ago). As the volcanoes subsided, the coral reefs grew upward forming low coral islands. Howland Island lies 1,650 sea miles to the southwest of Honolulu, and 48 miles north of the equator. It and Baker Island, which lies about 35 miles to the south and a little east, are located northwest of the Phoenix group, and are 1,000 miles west of Jarvis. There is evidence to suggest that Howland Island was the site of prehistoric settlement, probably in the form of a single community utilizing several adjacent islands. Archaeological sites have been discovered on Manra and Orona, which suggest two distinct groups of settlers, one from eastern Polynesia and one from Micronesia. Rich guano deposits were mined throughout the later part of the 19th century, however, the guano business gradually disappeared, just before the turn of the century. Thoughts of and activities on the islands disappeared. To affirm a claim, international law required non-military occupation of all neutral islands for at least one year. An American colony was established. The US Bureau of Air Commerce believed that native Hawaiian men would be best suited for the role as colonizers and they turned to Kamehameha Schools graduates to fill the role. On March 30, 1935, the United States Coast Guard Cutter Itasca departed in secrecy from Honolulu Harbor with 6 young Hawaiians aboard (all recent graduates of Kamehameha Schools) and 12 furloughed army personnel, whose purpose was to occupy the barren islands of Baker, Howland and Jarvis for 3-months. The American colonists were landed from the Itasca, April 3, 1935. They have built a lighthouse, substantial dwellings and attempt to grow various plants. Cruises by Coast Guard cutters made provisioning trips approximately every three months to refit and rotate the colonists stationed on each island. Soon plans were put into place to build airfields on the islands and permanent structures were built. In addition to their basic duties of collecting meteorological data for the government, the colonists kept busy by building and improving their camps, clearing land, growing vegetables, attempting reforestation and collecting scientific data for the Bernice Pauahi Bishop Museum. In their free time, they would fish, dive, swim, surf/bodysurf, lift weights, box, play football, hunt rats, experiment with bird recipes, play music, sing and find other ways of occupying themselves. Tragedy struck twice: Carl Kahalewai, a graduate of McKinley High School, died of appendicitis while he was being rushed home for an emergency operation; and on December 8, 1941, when the islands of Howland and Baker were bombed and shelled by the Japanese, Joseph Keliʻihananui and Richard “Dickie” Whaley were killed. Howland Island played a role in the tragic disappearance of Amelia Earhart and Fred J Noonan during their around-the-world flight in 1937. They left Lae, New Guinea and headed for Howland Island; the Itasca was at Howland Island to guide Earhart to the island once she arrived in the vicinity – they didn’t arrive and were never seen again. A lighthouse (later a day beacon) was built on Howland Island in Earhart’s honor. The colonists were removed, following Japanese attacks on the islands in 1942. 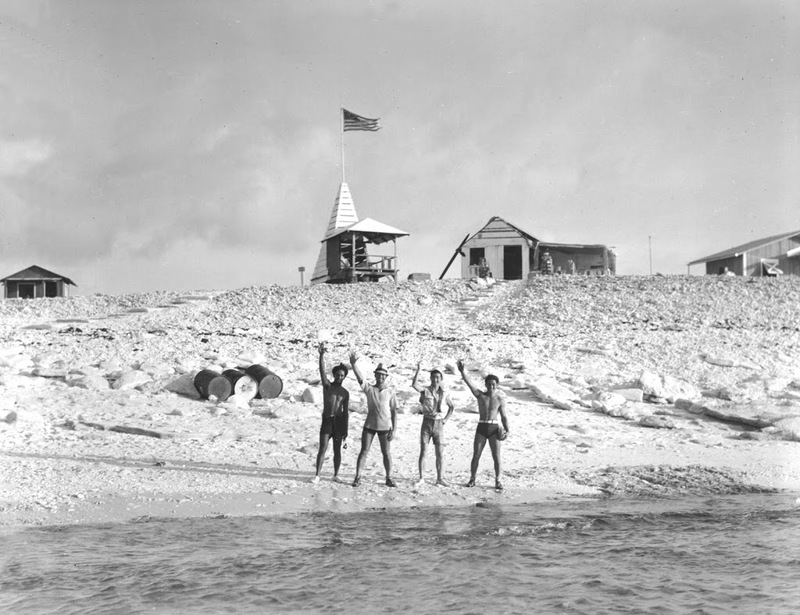 US military personnel occupied the islands during World War II. The islands have remained unoccupied since that time, but they are visited annually by US Fish and Wildlife personnel because the islands are a National Wildlife Refuge and later part of the Pacific Remote Islands Marine National Monument. (Lots of information and images here are from Bishop Museum.) The image shows four of the colonists (BishopMuseum;) In addition, I have added other related images and maps in a folder of like name in the Photos section on my Facebook and Google+ pages.